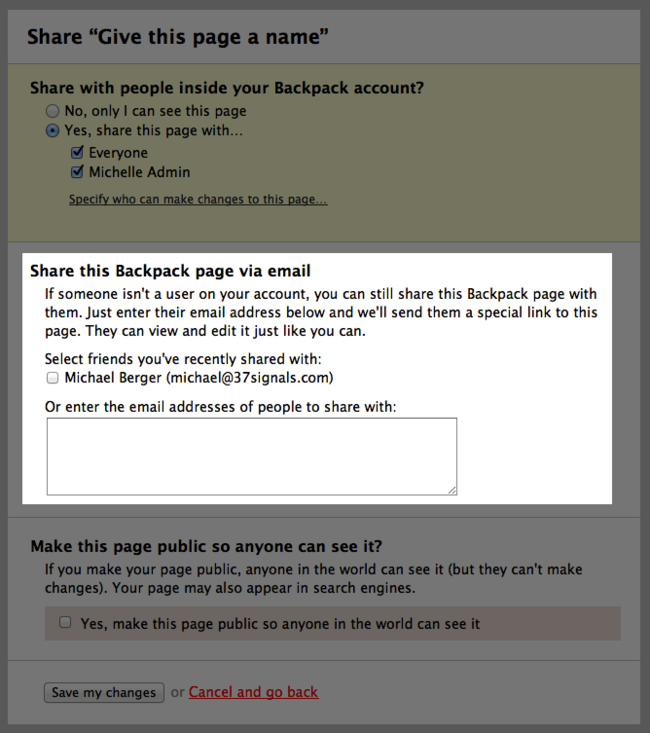 Backpack: Do people I share pages with need to have a Backpack account? 1. Click the “change” link in the upper-right corner of the page you want to share. 2. On the next page enter an email for the person with whom you want to share the page. If that person does not already have a Backpack account associated with that email address, he or she can view the page using a special link we’ll send them. However, if they do have a Backpack account, they can accept the page into their account and be able to view it as they would any other page. Pages you share via email are fully functional. Multiple people can collaborate on the page together by adding new list items, checking them off, adding a note, a file, a photo, etc. Note: People sharing a page via email will not be able to add or view comments on notes or list items.